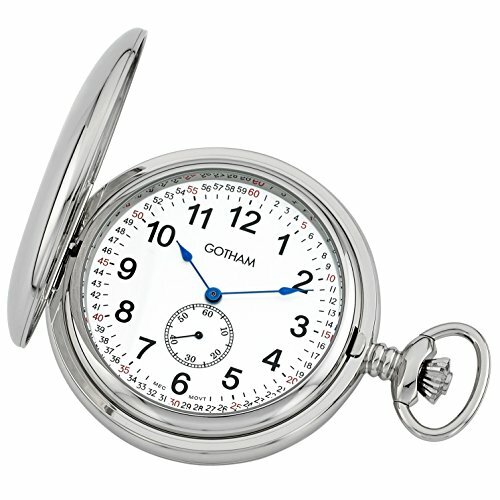 This classic and elegant double hunter silver-tone deluxe pocket watch from Gotham is the perfect addition to anyone's timepiece collection. Features include a precision 17 jewel mechanical small seconds hand movement, large 54 millimeter(2.13 inch) diameter highly polished silver-tone case, white ceramic dial with Arabic numerals and scratch resistant mineral crystals. Also included is a deluxe 14 inch steel curb chain with lobster claw end piece that can attach to your belt loop. As always, your watch will arrive beautifully gift packaged and include operating instructions, lifetime warranty and a Selvyt polishing cloth to keep your watch clean. This is truly a beautiful watch at a great price. Enjoy. If you have any questions about this product by Gotham, contact us by completing and submitting the form below. If you are looking for a specif part number, please include it with your message.